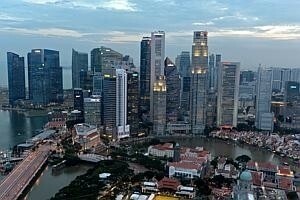 The Singapore economy could expand by up to 3.7 per cent in 2013, according to findings from the latest Business Times-UniSIM Business Climate Survey - higher than the government's official 2.5-3.5 per cent forecast, and more than twice the rate of last year's 1.3 per cent growth. In fact, the Republic could potentially see even faster growth in 2014, since Singapore is now the country most-cited by firms to have the best business prospects going forward - a position held by China for six straight years until it was displaced by Indonesia in 2012. Said survey director Chow Kit Boey: "China is facing several problems after a long period of rapid economic development. Its growth rate is slowing, and there is some uncertainty over policy changes that the new team will be introducing. Indonesia is losing its shine because of many difficulties, such as higher inflation and currency depreciation. "Compared to the two countries, Singapore is recovering well from its anaemic performance in the past two years and is thus viewed as holding rela-tively better prospects." Of the 166 firms polled from late September to mid-October, 21 per cent named Singapore as the most promising market, 19 per cent chose Indonesia and 15 per cent selected China. This contrasts with last year's survey results, where the top spot was held by Indonesia (20 per cent), the second by Malaysia (15 per cent) and the third by China (14 per cent). Even though one-fifth of respondents believe Singapore to be the most promising market for them, the survey's business prospects indicator showed that overall, companies here remain pessimistic about the next six months - albeit to a lesser degree than they had been a quarter ago. The business prospects net balance, which ignores the indifferent to take the difference between the proportion of upbeat and pessimistic firms, was a negative 11 per cent - up just two percentage points from the previous quarter. Still, business activities continued to improve in Q3 2013, even though results from the quarterly survey showed that performance remained in contraction mode. Said Ms Chow: "Business activities strengthened across all groups of firms in Q3 2013, signalling an imminent turnaround to an expansion path." Indeed, fewer firms registered contracting sales, profits, and orders or new business, compared to the previous quarter. After stagnating for four consecutive quarters, sales picked up in Q3 due to a reduction in the number of firms that encountered lower sales of up to 25 per cent. Better profit and orders results were recorded across all firms, whether large or small, local or foreign. Just over half of all respondents said they had business overseas. The four indicators tracked by the survey - sales, profits, orders and business prospects - have proved to be correlated with economic growth over the survey's 18-year history. The business prospects indicator, lagged a quarter, has shown the closest correlation to GDP (gross domestic product) growth rates. This time round, it predicts growth of between 4.2 and 5.3 per cent in Q4. "The predictions indicate that the Singapore economy could expand by 3.5-3.7 per cent for the whole year of 2013, which would be more than double the rate of 1.3 per cent growth in the previous year," said Ms Chow. While this is already above the government's full-year growth forecast range of 2.5-3.5 per cent, some economists believe such a growth outcome is possible - especially with recent economic indicators performing better than expected. Said UOB economist Francis Tan: "I certainly think that the results both for Q4 and full year 2013 GDP from the survey is plausible at this stage, especially given that our manufacturing industries' business activities are on an uptrend and the services industries remained robust in growth." Industrial production for September outstripped even the most bullish of market forecasts to grow 9.3 per cent from a year ago, on the back of a 20 per cent surge in electronics output and a busy time for rig and ship-builders. Adding to expectations of a better finish to the year was October's PMI reading, which rose to 51.2 from 50.5 in September, signalling a stronger-than-expected pick-up in manufacturing activity. With this, Bank of America Merrill Lynch economist Chua Hak Bin believes growth momentum could strengthen in Q4, and expects the government to raise its full-year GDP growth forecast to between 3.5 and 4 per cent. But OCBC economist Selena Ling has her reservations: "We are looking at 3.3 per cent for full year 2013 so (the survey's predictions) look a bit high for both the Q4 and full-year growth. While the leading indicators are improving, the US Christmas season orders may not have materialised in a big way, partly due to the fiscal uncertainties over the US partial government shutdown." Added Barclays economist Joey Chew: "We think the government may narrow its growth forecast for 2013 to 'around 3.5 per cent', but probably not raise the entire forecast range again just to be cautious and avoid sounding too bullish." Nevertheless, DBS economist Irvin Seah, who expects GDP growth to register 3.8 per cent for 2013 and 4 per cent in 2014, said: "Global economic conditions are improving. Barring any pre-emptive unwinding of loose monetary policy, the developed economies, specially the US and eurozone, remain firmly on their recovery path. China's economic momentum is picking up again. These factors should remain supportive of Singapore's growth outlook in the coming quarters." With final GDP figures for Q3 due for release this Thursday, the median forecast of 14 economists polled by Bloomberg points to an expansion of 5.3 per cent - ahead of the government's flash estimate of 5.1 per cent year-on-year growth.